We’re not the most sentimental bunch here in Las Vegas. Most of our traditions get blown up, bulldozed and steamrolled to make way for the next big thing. Occasionally, someone cares enough to stick some artifact in a museum or storefront. But more often, the object in question simply disappears, never to be seen again, like the Bugsy Siegel suite at the Flamingo. That’s why I find it comforting that a handful of old-time establishments have managed to hang on, sometimes for decades. Like the Peppermill restaurant on the Strip. 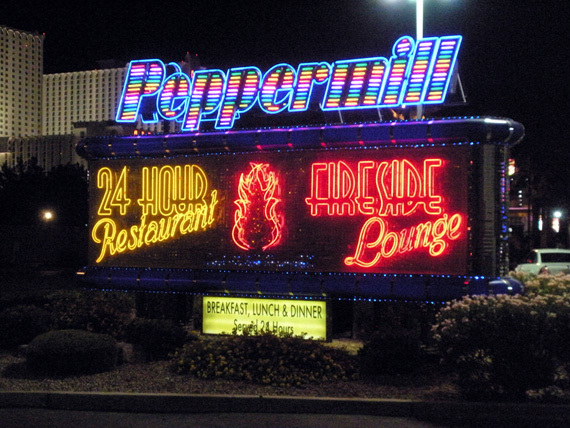 The Peppermill opened its doors on Dec. 26, 1972, at 11 p.m. I know what you’re thinking. “That’s only 37 years – big deal.” Well, it is by Las Vegas standards. This ain’t Manhattan or Chicago, after all. Time takes on a different meaning here. If you’re heading north on the Strip, the Peppermill will be on your right, wedged between the Silver City Plaza and the Riviera Hotel. The Silver City Plaza derives its name from the now-defunct Silver City Casino, which closed its doors for good in 1999, despite a last-gasp attempt at survival as the only nonsmoking casino in town. (I could have told them it wouldn’t work, but nobody asked me. Smoking and gambling go together like drinking and gambling. In fact, the more vices you can pile into one session, the better.) That’s something else you should know about Las Vegas – the names of things usually outlive the things themselves. Or they get recycled. If you head down to Lake Mead, for example, you can stop at a little hotel/casino called the Hacienda. If you’ve seen a great film like “Casino” or a really bad one like “Showgirls,” you’ll recognize the Peppermill the minute you walk in. Both movies had interior scenes in the restaurant and lounge; so has the “CSI” TV show. The aptly-named Fireside Lounge, dark and intimate, is where you’ll find the Peppermill’s signature element: a fire pit with gas flames dancing out of a pool of electric-blue water. Sidle up to the bar and order one of 60 exotic drinks from Alabama Slammers to Zombies. Or live dangerously and try an ice cream drink specialty like a Creamsicle or Ultimate Mud Slide, concoctions that taste like milk shakes but sneak up on you fast. 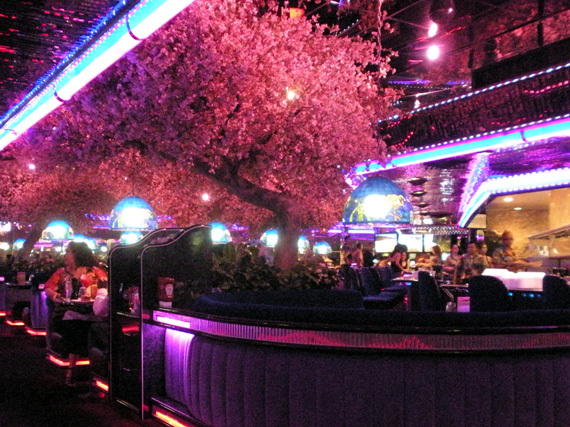 In the end, though, the Peppermill is about the food – more than 100 menu items in all. My wife and I bring our appetites on a recent June afternoon, knowing that the Peppermill has a reputation for generous portions. My wife orders Dijon chicken, which comes with a choice of soup or salad (tossed green or spinach), veggies, potato and garlic bread. Our server, Sarah, is helpful and attentive without being overbearing. “The spinach salad has bacon bits, eggs and a red dressing,” she volunteers. It’s also accompanied by a chilled fork, an unexpected touch. I opt for a mushroom Swiss burger and onion rings. (Onion rings or potato salad can be substituted for fries at no additional charge.) When Sarah brings our food, the blond lady from Boston in the adjacent booth gasps, “Oh my God, look at the size of those rings.” I offer one up and she readily grabs it from my plate. “Be sure to tell everyone back home how friendly the locals are,” I suggest in my best Chamber of Commerce manner. The burger is a half-pound of Angus beef, perfectly broiled, spilling out from the soft, fresh bun. My wife’s portion is even larger, two chicken breasts complemented by a mound of real mashed red potatoes and fresh, not frozen or canned, green beans and carrots. “If they come in just for dessert,” she smiles. The bill before tip, including iced tea, is $36 and change, a real value for the money, especially on the Strip. After dinner, I talk to assistant manager Martha Montague, a trim, bespectacled woman who’s been with the Peppermill since the day it opened. 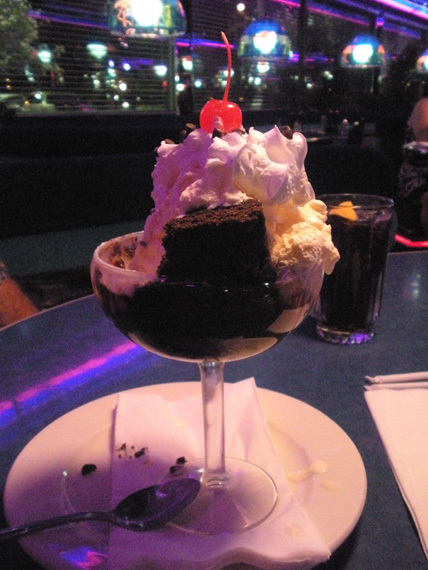 I LOVE the Peppermill. You’ve really captured its charm. Even though it’s right on the Strip, I’ve never had trouble finding a place to park. Amazing! “The Peppermill isn’t going anywhere.” Excellent news. Just ate breakfast there yesterday. You’re certainly right about the portions. I still have some Denver Omelet left. One of the original places I used to go when I moved here 18 years ago. I used to get off work at Vegas World at midnight and go there. In the early 80’s, I lived in Denver and there were two Peppermill Restaurants, and they were just like the one on the Las Vegas strip. Everything in the restaurants back then was orange, including the waitress outfits. I never could get used to colored sugar crystals in glass jars on the counters. I got to know several of the managers in both Denver and Las Vegas. All the workers I met there have been very pleasant. A lot of things have disappeared over the years, but this one is an oldie but goodie. I just read in Norm’s column that the Peppermill is a Holly Madison fave! 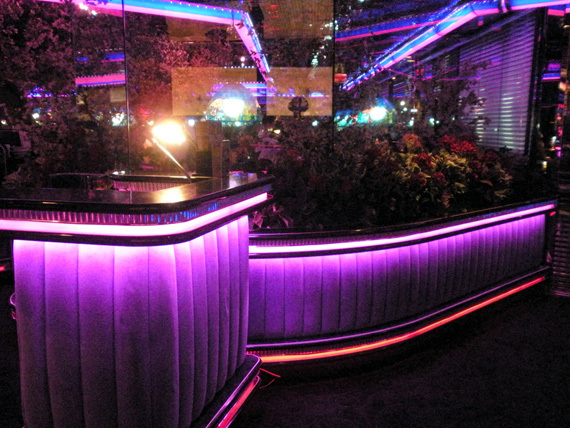 I love it too — if you want to have a real conversation with someone along with a drink, their bar is the best!